We review an Ecuador Water problem below. See an important water investment update here. There is a lot of pure water in Ecuador. This is one of the country’s great assets like Chachimbiro thermal springs. Here we are some clients enjoying the purest of Ecuador water with one of our groups as we soak for health and longevity in the Chachimbiro thermal springs near our hotel. The Ecuador water comes hot out of the mountains. The Ecuador water is super hot at the top, about 120 degrees. We begin there. There is an ice cold pool next to the super hot so one can go from hot to cold. Only a few of us do that. Very few as you can see, you know who, dipping alone in the cold. However there are some water problems in Ecuador. Ecuador living subscribers can read a more extensive password protected Ecuador Water Report here. If you are not a subscriber and want this report learn how to subscribe here. Below is an excerpt from that report. Hello Gary, We are the group from Ontario, Canada who are reading constantly your news. We’re surprised that you have said nothing about protests, blocking roads and the biggest revolt in your city. Why is that? Would you mind to explain the source of protests and why the water before was privatized and now belongs to the nation and why Indians are fighting new water management regulations. to Quito is constantly blocked and cleaned. I sent a reply to the reader but wanted to give Ecuador Living subscribers a full report so here are replies from research all around the country about the recent Ecuador water demonstrations. “We’re crazy for water,” chanted about a thousand campesinos as they marched through the streets of downtown Cuenca in southern Ecuador on Monday. The march, called for by the Confederation of Indigenous Nationalities of Ecuador (CONAIE), was part of a nation-wide mobilization against a new water law. It included intermittent road blockades throughout the highlands over the course of the day that by all accounts were peaceful. My reply to this reader was: “Not a soul has mentioned this to me so it must not be very important. If you check our archives you’ll see I have written numerous times about the indigenous tradition of blocking the roads. If this were a big problem our hotel would let me know. .. but the press often blows these things out of proportion. “I’ll certainly check this out and report what I find. “I wrote not long ago about the Ecuador water problem which has been going on since Incan times… much like here in the US… those downriver claiming that the water up river belongs to all. “Canadians have so much water that it is not much of a problem… but here in the US for example I can only water my gardens from my own well twice a week as the people claim the water table below my land belongs to all. “At our farm in North Carolina I am restricted from taking the water from my creek at the detriment of my neighbors below us. But in the East the water shortages are then the real water wars… in the West of the USA. “Californians even tried to create a water pipeline, I believe from British Columbia, and many up north are not happy with this. An article at http://www1.american.edu/TED/water.htm)reviews this when it says: Canada is attempting to ban its massive exports of fresh water to its neighbors including the United States. Canada believes that water will become the most essential environmental source in the next century. The United States on the other hand, has always been refusing this ban that may harm other nations who lack such a vital source. Canada, as it holds a fifth of the world’s fresh water supply, fears to face a huge environmental problem if it carries on shipping a huge quantities of water to external nations. “Since this is such a common problem in so many places I do not write a lot about that but if you check our archives you’ll see I write a lot advising to invest in water. #1: Alberto Verdezoto on the staff of our Inn Land of the Sun sent this editorial from the daily newspaper El Comercio which outlines the tensions: Interview of the Day | Tuesday 11/05/2010. For the indigenous water closed roads and organized protests in the Assembly is debating a law to regulate its use, why does the water generates clashes? Without water no life. In the past century the struggle was over access to land, the water now, because this resource is becoming scarcer. In recent decades, the rains have fallen and destroyed native forests are born watershed feeding the moors. There are the rivers that supply the irrigation canals, hydroelectric and drinking water systems in cities where water is used for bathing, washing the car, the clothes’ is an important resource. In the field, the water irrigates the farm. This is the most important asset of the farmer. What is the difference in water use in the field? The country has 12.333 million hectares for farming, but only 800 000 have access to irrigation canals. For the Indian heritage is their farm. It is most important. A farmer must be 60 000 liters of water to irrigate one hectare. An irrigation crop requires about three times a week, so you need 180 000 liters. As there are no channels, people moisten the earth with rain. People are leaving because their lands are dry. So there is anger and communities mobilize and fight for access to this resource. With this juncture on the discussion of the Water Act, I have the perception that Indians are the only ones who realize the serious problems caused by lack of water. For them, water is a matter of life or death and are willing to do anything to access this important resource. Even in some communities are fighting over access to water. Three months ago there was a sharp clash between members of three rural communities in Cotopaxi. The Indians appeled for access to an irrigation canal and up the slopes close to defining who can use water for their crops. In Cotopaxi, Pichincha, Imbabura and other provinces of the Sierra these clashes occur. When it rains, the fights are increasing. In the city what happens? City dwellers still see the problem as something remote and rather we die from the wrath of the tracks are closed and organize protests. We do not realize that and we have no idea if it exacerbates water shortages in the countryside, where the slopes are formed in the cities we have very little liquid. We will have to access the service schedules, set a limit of time for swimming and water a garden is a luxury. Are there any studies indicating how many sources have disappeared? In Latin America, Ecuador is one of the countries that destroys nature. You can not say how many strands disappeared, but studies by the United Nations Organization and the Ministry of the Environment indicates that lose more than 250 000 hectares of native forest annually. Environmental groups say they are 350 000 hectares. I am convinced that in this country one of the greatest damage to nature happened in the seventies and eighties. That year was a boom in manufacturing guaiac wood floors and began clearing forests and dry Zapotillo Macara, who are in the province of Loja. What has this to do with water? It felled the forest and disappeared around the slopes. No doubt the business of guayacán enriched many, but the bill that paid people in those counties was high. It did not rain for eight years and peasants migrated to the Amazon, where they founded the province of Nueva Loja. This exodus was terrible. The country went through this experience but not learned the lesson. In Esmeraldas is deforested. In this province there guachapelí trees, lignum vitae and mahogany. Again, do not take into account what happened in the province of Loja and we continue to clear the forest from where the slopes. Conservation should be a source of government policy. The law is paramount. Beyond the political and economic situation, we must analyze the issue technically and make plans. “The preservation of the sources is an obligation of the State? “Yes, the State should be encouraged to conserve indigenous sources. For example, the community most native plant trees can be given credit, build a cellar for storing what they harvest, and so on. 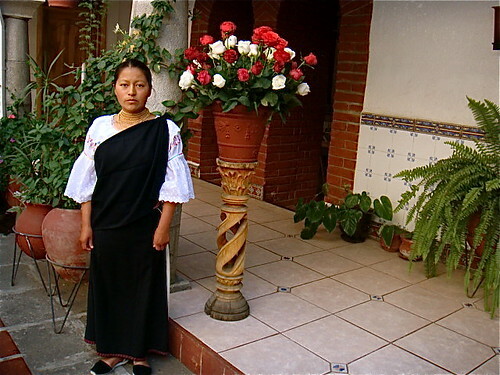 In communities of Chimborazo and Pichincha is interesting conservation programs. Under the plan must also be taken into account in the urban area. It is urgent that the cities are aware of the importance of optimizing water use. While we do not know value the resource, the issue of conservation is not part of our daily lives. Continue as a distant issue. “In the field must charge a fee for access to water? “Irrigation Boards charge to maintain the irrigation canal users. And the communities have accepted this without question. In addition, they organize work parties to clean the canal. Here are replies from our numerous contacts around the country. Merri also replied to the reader above as wrote: Thanks for your note. The indigenous do rise up all over Ecuador when they feel that they are mistreated…how do they do this?…by shutting down the Pan American Highway and also by banging on pots and pans. We do not ever advise living in Guayaquil. Out in Cotacachi…what happens? Well, this is the largest indigenous market in the world and believe me they do know when a shut down occurs they lose thousands and thousands of dollars…so what happens? Well, there is a day or two when traffic stops on the Pan Am and then it ends and this will probably continue throughout the nation for decades because the indigenous have NO other way to let the higher ups know what they are experiencing. Believe me, I grew up in Ga. with the race riots in Albany, Ga. where I personally saw policemen killing blacks on the downtown streets and I am not spending anytime in any place that offers that again….Ecuador is the 2nd largest nation on earth of Indigenous and they are dirt poor and one can only agree that they have their say…but in the literally dozens and dozens and dozens of demonstrations we have witnessed, it works out just fine for all. Water rights are big issues and farmers must have water. There has to be a resolution there…but believe me Otavalans are totally dedicated to business and that’s why Gary and I no longer live in communities where there are huge factories (near Cotopaxi) and these shutdowns are done by workers. The indigenous where we are in Ecuador are entrepreneurs, business people and these people do understand that it is important to keep commerce alive without ignoring their rights. Some Americans have unjustly taken their water and this must come to a halt. Water has not been privatized but when the indigenous own a spring of water (as we have voiced for years to developers), then something must be done to repay them or to help them…no one should simply steal their water! Gary and I own a large farm with 33 natural artesian wells in NC and I can tell you that we wouldn’t stand for a neighbor who just a)helped himself b)polluted our water! We have written about demonstrations on numerous occasions. There were some Ecuador demonstrations last week. 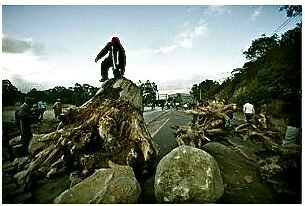 This and the AP photos below by Dolores Ochoa show Ecuador protesters blocking the Pan Am Highway. See excerpts of the related article below. Merri and I are used to these Ecuador protests as they are part of life in Ecuador. Though we have not seen any Ecuador demonstrations for several years, they represent a good part of the Ecuadorian way and I am proud of how the people exercise their democratic rights…. peacefully… but effectively. The number of these demonstrations seem to go down year after year. The French use demonstrations as well and remember France is where many of the current ideals of democracy as we know them and processes that helped the industrial revolution really begin. Yet the French leave cars flipped and shops burned. Remember what they did to some of their royalty! In Ecuador violence is rarely the case. Part of Ecuador’s political problems are created because the majority of the population are very poor… and poorly educated… but they are gaining. This is Maria… excited to be headed on her first day to university to study tourism management through a scholarship provided by our foundation, Land of the Sun…she is the very first in her entire village to attend university! Merri and I have been in the midst of several Ecuador demonstrations. Our first protest party took place many years ago in the 1990s. We had to get a friend from our small village near Latacunga, (one of the most active places for demonstrations), to Quito Airport. There is a “moving through Ecuador road blocks art” that we learned. Ecuadorians are by nature friendly and easy going. Violence is rare… in their protests, crime or politics. These girls attend the Topo Grande school that Land of the Sun foundation is assisting. In that first protest adventure we were with a yatchak… in his car… a four wheel drive. This meant that a lot of the demonstration avoidance tactics came in the form of driving down railway tracks, through football fields and for quite some distance on the grassy path that formerly was the Incan Trail! Eventually however one meets a roadblock. On that trip the yatchak did most of the work. As gringos we stayed in the car and let the yatchak do the talking. Most road blocks are more like street parties… the blockers only half serious. There are generally two types of demonstrators… those with a real gripe and the majority who see the demonstration as a sort of fun time. If you meet up with the party types… usually a dollar or two is a sufficient consideration to be able to move on IF one approaches the road block correctly… never with pushiness or aggression and listens carefully to the complaint. If one meets up with those who have a true grievance… the process is more difficult but usually an earnest listen to their complaint… a murmur of agreement, some sympathy and an explanation of why you need to pass through, will often open the block. In that first trip, the taxi drivers had the complaint… so they were the hardest nuts to crack… but the yatchak never failed. Gentle words… appreciation for their plight and explanation of our own problems always opened the gates. That trip to the airport took much longer than normal… one does not rush through these events… but we were able to help our friend board his plane on time. Our second Ecuador demonstration trip took place on the day before one of our seminars in Ecuador. Talk about terrible timing! We always met delegates when they arrive at the airport the day before the seminar so we needed to travel from Cotacachi to Quito. Normally we would make the two hour trip via the Pan American Highway. But Otavalo is another major, strong point for demonstrations. We have developed a network of friends across the country so we knew that the Pan American was tightly closed. So we headed down the back roads with an intrepid taxi driver who knew the ropes. At each road block I would lay down in the back seat, close my eyes and groan. Owh owh owh. Merri, looking as pathetic as possible, rambled on “Me esposa necesita un hospital”. The taxi driver requested clearance to the “hospital” and offered a few dollar for the favor. This worked half way to Quito. However there are some road blocks that just cannot be passed. We found such a place where one group had dug a large pit through the road. Another AP photo shows how some road blocks cannot circumnavigated. Here I experienced a major recovery from my illness, grabbed our suitcase and we walk through the burning tires… NOT LOOKING ANYONE IN THE EYE. The only hangup came when our hound dog Ma became tangled in the wires from burned tires. Merri just scooped her and all the tangled wires and ket on walking. On the other side of the road farmers awaited with their pickups. For $20, they were willing to give us a lift into town. The normal two hour journey turned into six…. but we were there, smiling when our delegates arrived. The demonstrations (as with those last week) lasted only a day and we accompanied our delegates on the bus back to Cotacachi next day on the Pan American Highway. No one really suffered. And those who demonstrated were able to express their complaints. In short Ecuador demonstrations can range from kinda fun to frustrating… but rarely dangerous… as long as one takes their time, remains passive and avoids getting involved. These Ecuador demonstrations, are in my opinion, a good part of Ecuador’s democratic process. I expected political tensions to tighten in January… but they seem to be winding up sooner. Here is my thinking why there will be more political turmoil in the months ahead. Part of Ecuador’s political problem began over 500 years ago when the Spanish began colonizing the area that is now Ecuador. The system favored a few at the expense of the majority and has remained that way. Today the majority of the population is indigenous….but historically have had little political power and they have the smallest portion of wealth and income. Here is a resident of the village of Topo Grande. Slowly they have become increasingly organized and must be considered as a political power that now determines elections. Yet due to the fact that they still remain among the poorest sector of the population, they also understand the global economy the least. 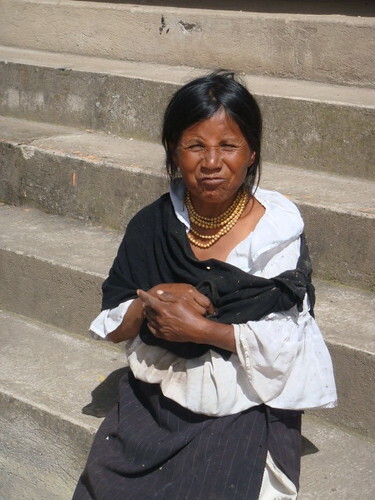 Almost every Ecuador president, since Merri and I began living in Ecuador, has been elected in part by making promises to poor people, like this lady above, that could not be kept. President Correa is included in this definition and had two added benefits… his ability to speak Quichua (the indigenous language) and high oil prices when he entered office. Oil revenues provide the major part of the government’s income and the high prices allowed Correa to keep many of his promises in his first years in office. Then oil prices dropped and the government began cutting back. This put so much pressure on the government income that in July 2009 it sold a billion dollars of oil to the Chinese. An excerpt from a Reuter’s article entitled “Oil-hungry China moves to strengthen Ecuador ties” explains as it says: QUITO (Reuters) – Oil-hungry China is moving to strengthen ties with OPEC member Ecuador, part of a global trend in which the Asian giant is providing billions of dollars in financing to producer nations to guarantee energy supplies. Ecuadorean President Rafael Correa said on Saturday the country will receive $1 billion as advance payment for future oil sales to China. Ecuador sends most of its oil to the United States, and is trying to diversify its market. Details remained unclear on Monday. But China, the world’s second biggest petroleum consumer after the United States, is striving to cement better ties with resource-rich Ecuador. Chinese company Sinohydro is bidding for a contract with Ecuador to build a $2 billion hydroelectric plant in the country. In addition, the leftist Ecuadorean government says it is in talks with Chinese companies interested in investing in the Manta air base, which the U.S. Army is due to leave in September. Ecuador wants to build a commercial airport in Manta. According to the Chinese customs office, China imported 326,000 tonnes of crude oil from Ecuador in the first four months of 2009. Ecuador is the fifth largest producer of crude oil in South America after Venezuela, Brazil, Argentina and Colombia. It produced 486,000 barrels of crude oil a day in May. Impoverished Ecuador faces a liquidity crunch due to low oil prices. The government’s recent debt default has shut the country off from the international capital markets. Here is how one sharp Ecuador businessman explained the problem to me. The government took payment now on 30% of its future oil, beginning next January to balance the current budget. How will it balance its budget next year with only 70% of its oil? This leaves the Ecuador government only two options… higher gas prices… a factor beyond its control… or a cut back which means breaking more election promises. However the problems were worked out (perhaps just pushed forward) and those Ecuador demonstrations in 2009 ended just as those in 2010 have. Ecuador demonstrations are a part of Ecuador’s democratic process. Since spending time in Ecuador, I have seen many presidents come and many go… very few serving their full term… a process I like better than having a bad president last. When the people dislike what the politicians are doing they come to the streets peacefully and this does get action. Wouldn’t it be nice if we could do this at home? Join our June and July real estate tours. You enjoy discounts by attending multiple seminars and tours. Here are our multi tour adventure discounts. Ecuador Living © 2019 All Rights Reserved.